Easy to throw together, these flavorful and moist meatballs make a great weekday supper and they are low cal. Served with a dollop of lemony yogurt with a salad and some pita bread, dinner is ready in 30 minutes. To serve as a party appetizer, make the meatballs smaller and reduce baking time. Preheat oven to 375F. Combine all ingredients and form into 16 heaping tablespoon-sized meatballs. Bake on a parchment lined sheet for 20 minutes. Then broil for 5 minutes more to brown. Combine all ingredients in a small bowl and serve a dollop over the meatballs. Makes 4 servings. 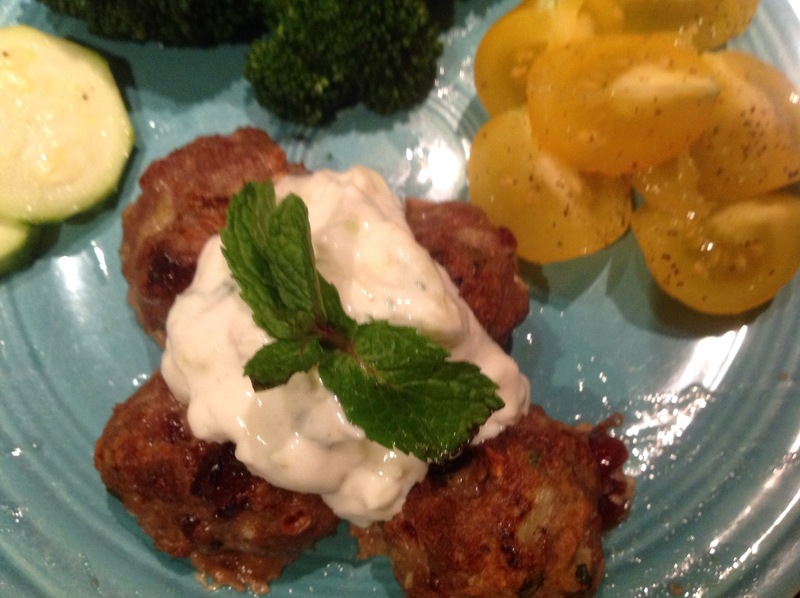 This entry was posted in Recipes and tagged baked turkey cranberry meatballs, turkey cranberry meatballs with lemon-mint dip, turkey meatballs by Johanne Lamarche. Bookmark the permalink.